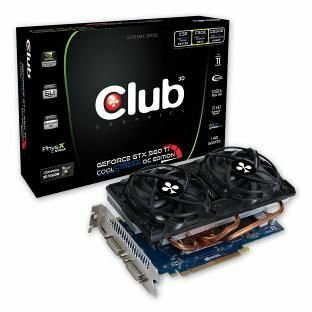 Club3D introduced a new GeForce GTX 560 Ti CoolStream OC graphics card. It offers a 900MHz core and 1GB GDDR5 clocked at 4100MHz. Club 3D B.V. brings another GeForce GTX 560 Ti CoolStream OC Edition card to market. This new Club 3D GeForce GTX 560 Ti CoolStream OC Edition features the award winning CoolStream thermal solution. Three pure copper, 6 mm diameter thick heatpipes, ensuring an efficient temperature dissipation. In addition to the high quality heatpipes, two big 92 mm temperature controlled fans, provide a dramatically improved airflow (54CFM) compared to the standard GTX 560 Ti design (35CFM). No need to upgrade to an expensive third party cooler, CoolStream is all you need. The Club 3D GeForce GTX 560 Ti CoolStream OC Edition comes factory overclocked with 880 MHz GPU clock speed offering on average 10% better performance compared to the standard GTX 560 Ti design. The card is already available in the shops and should cost around USD 289 ex VAT.